December | 2012 | ___is black the new black? Lasagna roll ups – pretty much how my mom has always made them with the addition of spinach, but if you want a recipe, Giada de Laurentiis has one here. I omit the bechamel sauce. 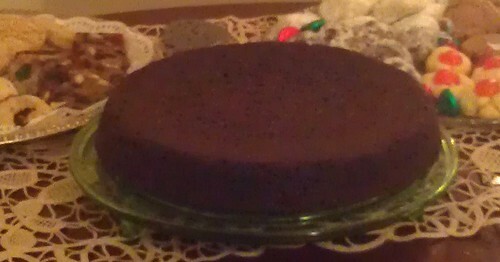 So let’s talk about that gingerbread cake. It’s a Bon Appetit recipe. 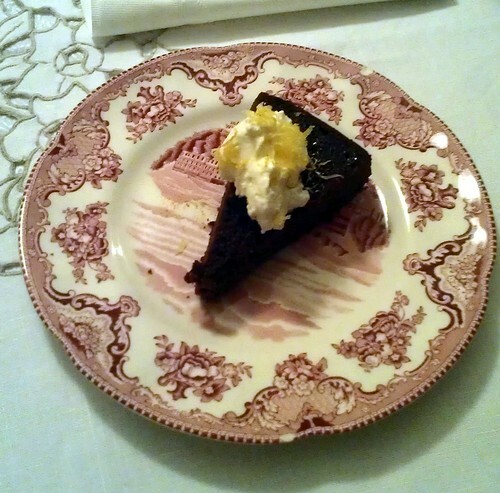 Think delightfully dense spice cake, but gingery.I add a little more ginger and use blackstrap molasses in lieu of the light kind the recipe calls for. I’ve made it before (with and without the topping), and had gotten a little cocky. I decided to make it for a work holiday function and without paying much attention, used a 8 inch round pan instead of the 8 inch square pan. Turns out math is important after all! Who knew? (Yeah, you can all stop snickering at me now). I ended up with gingerbread cake soup and had to add on like 10-15 minutes more cooking time. I opted to use a 9 inch round pan for the one I made for Christmas and other than panicking at realizing I was out of parchment paper (thank you, Joe for calming me down and explaining that wax paper would work just fine), it came out quite nicely. The topping is whipped cream with a bit of lemon curd folded in. Add a bit of grated lemon zest and you have a really nice dessert. I had a surfeit of potatoes post Thanksgiving and I got to thinking about what I could do with them. I got to thinking about potato kugel. For those unfamiliar, it’s not the most glamorous or complicated dish. 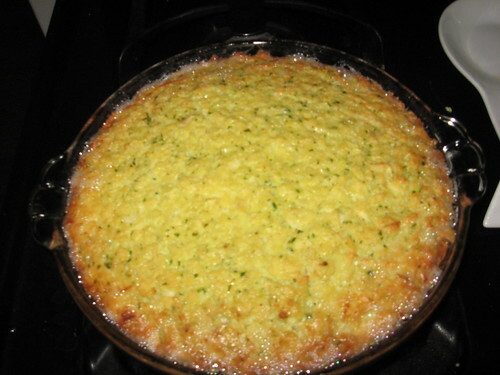 It’s composed grated potato, onion, eggs, and usually something like chicken fat or oil. Then it’s all mixed together and baked. Mom used to serve it alongside this really awesome honey roasted chicken. So I asked my mother if I could have the recipe and after some searching she produced for me “Spin Cookery” the Osterizer Blender Cook Book. Below is my Osterizer–same kind Mom has. 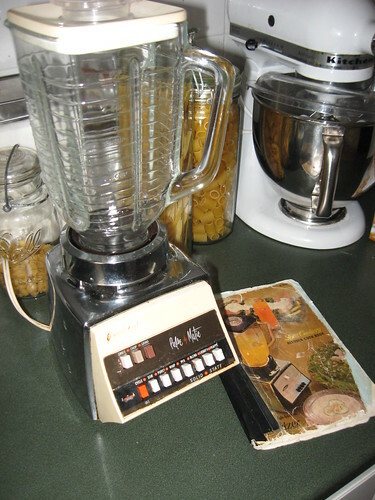 I purchased it used at an estate sale for $8 and it is a great blender. Note the black electrical tape holding the book together. This is the kind of cookbook that someone like James Lileks would happily tear to shreds. 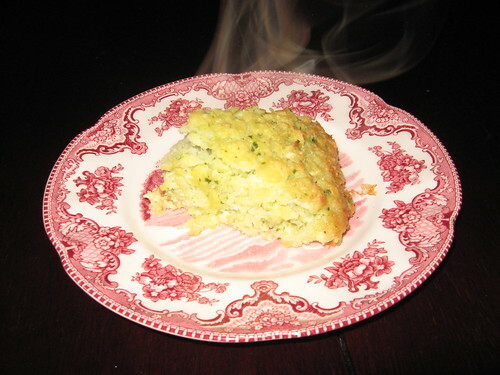 There are recipes that make you go hmmm and recipes that frankly work just as well with a bowl and a whisk. But there are some things I remember quite fondly. The popover recipe for instance beats the one in Mark Bittman’s How to Cook Everything. The kugel is pretty basic. Preheat oven to 350F.Grease a 1 1/2 quart casserole. Blender grate potatoes. Drain well. Put remaining ingredients in blender and process only until parsley is chopped. Mix batter thoroughly with potatoes and pour into the casserole. Bake for 1 hour. I opted for turkey fat because well I was dealing with the turkey carcass and stock. I used a glass pie plate because that’s what my mother would use. I also consulted her (and the internet) about this mysterious “blender grating.” I’m pretty sure I would have gotten a better kugel by using my box grater, but I wasn’t after better. I was after sense memory and Mom said she did blender grate. Turns out my Osterizer has a “Grate” setting on it. You put the cubed potatoes in and 2 cups of cold water. Hit grate and in very very quickly you are left with these very fluffy bits of potato. It’s not quite right. I recall Mom’s being a denser and a little more colorful. I wonder if she added in some other vegetables. She’s famous for not telling me every little detail. Not out of malice, but because I think she’s made these things so many times that she does some things automatically without thinking about it. But it was pretty close to what I remembered. It smelled right too. The taste was close. I wonder if Mom used something like vegetable oil or margarine in lieu of the prescribed chicken fat/butter. I would like to find a more authentic kugel recipe (they seem to involve a LOT more eggs) and/or try this with box grated potatoes, but I wasn’t disappointed with this. Now if I just had the honey roasted chicken to go with it.